467 patients were examined for the epidural effects of morphine. Long term relief can be achieved in chronic and perioperative pain conditions. It was observed that the pain diagnosed by a somatic origin was controlled by epidural morphine with no side effects. In contrast, deafferentation pain was only poorly controlled and was commonly associated with untoward side effects. 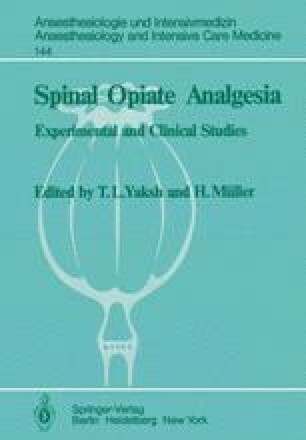 Treatment of pain thought to be of a psychogenic origin with epidural morphine was unsuccessful and usually unaccompanied by side effects. These results suggest the use of epidural opiates as a prognostic tool in diagnosing the origin of various pain syndromes.